While looking through old photo files recently I came upon a folder of several scans made from Kodachrome slides. These slides were all taken in Argentina in 1987 mostly on Kodachrome 200 film with Nikon film cameras. 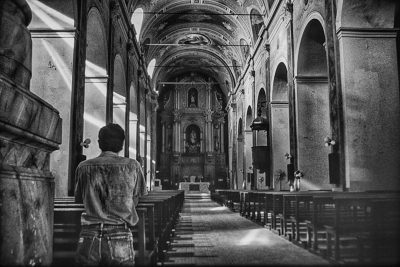 The occasion of the trip was to investigate a document the Christian religious revival sweeping across the country at that time following the fall of the dictatorship, a subject of at least one movie. AS I looked through these images, just a sampling of the hundred of pictures still on film, it interested me to see which images I had chosen to scan into my digital files. I did take many shots of scenes like this one, mostly in the seven cities I visited. 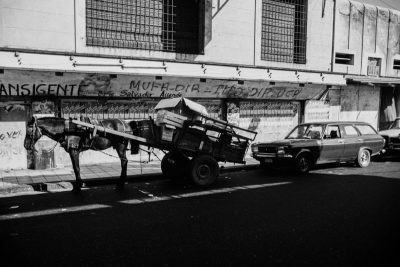 Scenes like this one appeal naturally to North American travelers who do not often see such a combination of horse drawn carts and cars. 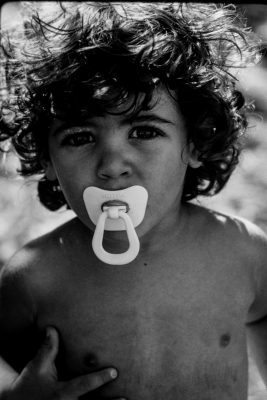 But what struck me most powerfully was the clear preference I had and have for the pictures of people, especially individuals young and old.This one most especially continues to get my attention. 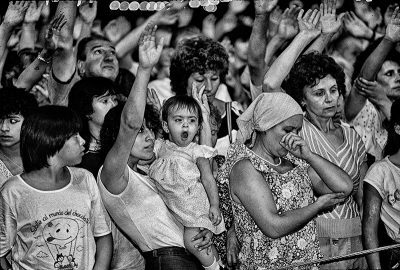 Argentina girl at an outdoor religious meeting, 1987. The lights in the background are bare bulbs. 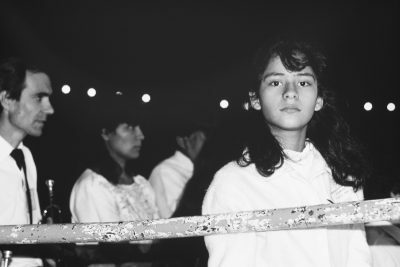 This striking portrait of a girl attending an open air meeting continues to speak to me. Her soul seems to be showing, or is it mine? 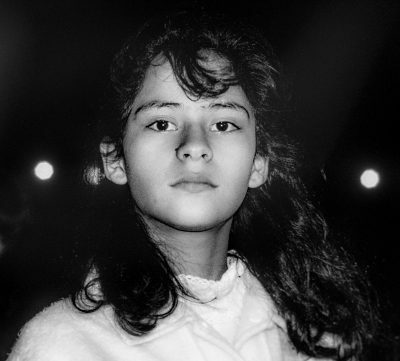 given that this was thirty years ago, and she appears to be in the vicinity of ten years old . . . you do the math as it is now the summer of 2017 as I write this. Is she alive? What has become of her? What about those she was with that night –the fact of night signified by the bare bulb lights seen in the background. But the first shot I took shows her in the crowd, and the close portrait of her followed. As I continued to look through those old files time after time it was the people shots that engaged me and continue to draw out my own soul, and curiosity. Some of these, I suspect, are no longer here. What did these clearly intense moments mean to them then, and subsequently? 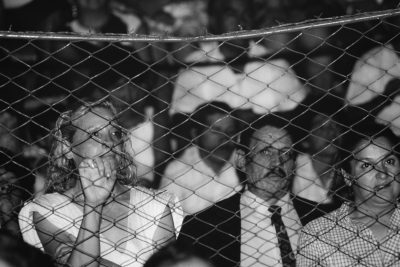 These two images show people behind a chain link fence because the meeting was being held in a large boxing arena where the fans were evidently kept by from the ring. 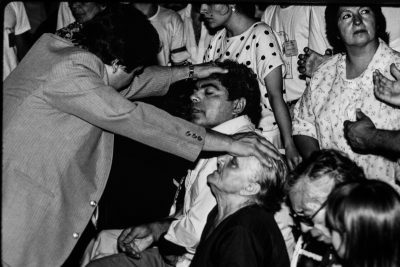 An outdoor Christian worship service in Argentina, March, 1987. These were from a large open air meeting at night, I believe the same meeting attended by the girl in the earlier picture. It was a preaching and healing service. It was both inspiring and sad simultaneously. But again my tendency was to focus on individuals and faces where possible. It is in the faces we experience the wonder of the human soul, the magic of this creature beyond earthly compare, and perhaps unique in the entire grand cosmos. And there were the children. These often late night meetings always included children as families attended together. The churches were mostly Roman Catholic at the time, and people came to them to pray as do people everywhere. But the Protestants were busy building new churches. The man working with concrete was helping to build one of the new, and quite large Protestant churches. 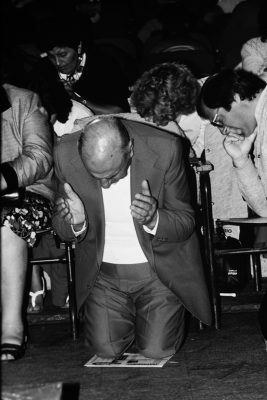 Man in prayer at a church in Santa Fe, Argentina, 1987. Pictures serve us in many ways. These record a place in history. I wrote about it in the now defunct Eternity Magazine after I returned to the states. But for me these photos are more than outward history. They represent a time in my own life with which I associate many other things. 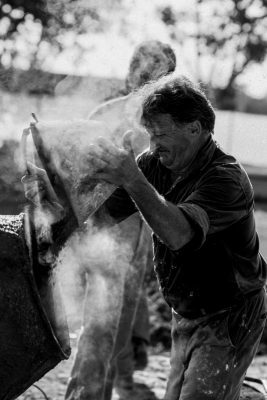 I have written a little abut this in an earlier blog, but now I find these files hold a special place in my heart as I continue through unforgiving time to appreciate afresh the wonder of being human in a world of both magic and suffering.